In 1932 Ireland was caught up in religious fervor. Flags, bunting and other decorations were everywhere - draped across public buildings, hung from trees and lampposts and pictures and other items. 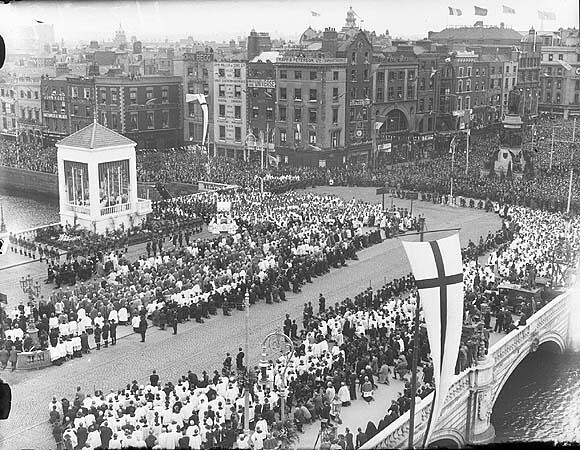 They prayed together in public, including one particularly large celebration along the Liffey that drew thousands. Here we are in 2012 and it's almost as if history is repeating itself. The Eucharistic Congress is again in Dublin and there flags and decorations everywhere. The people are gathering in groups large and small to sing out as one and beseech the almighty to look benignly upon them. There is, of course, one slight difference this time: the mass gatherings are not at Mass, but at soccer games. The large gatherings along the Liffey this time are watching a giant screen showing Ireland's games at the European Championships in Poland and the flags and bunting are green, white and orange and not the yellow and white of the Papal flag as was the case in 1932. 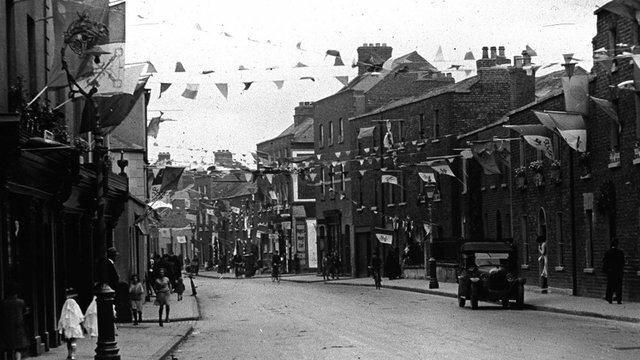 Dublin street decorated for 1932 Eucharistic Congress. Yes I'm being flippant, but there's truth in what I'm saying. 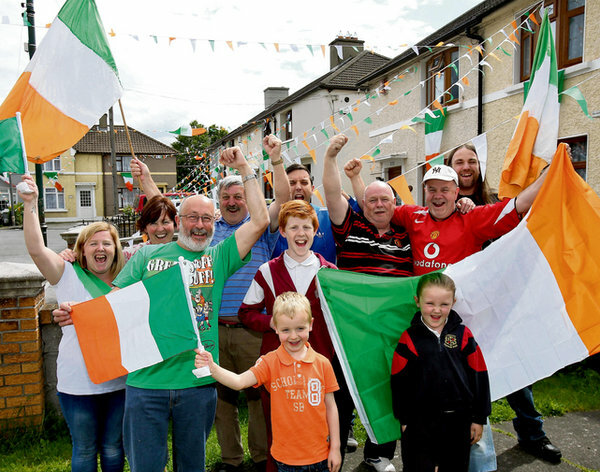 The Eucharistic Congress that's taking place in Ballsbridge in Dublin has hardly scratched the surface of the public's consciousness thanks to the obsession with the Irish team and the soccer tournament. There are probably some Catholics here who are disappointed or worse that the Eucharistic Congress is getting so little attention. It doesn't worry me. I actually think it's good for the Church that Catholics can gather this week without the pressure of a lot of media attention. Even those attending the Congress are probably glued to the Ireland soccer matches. I can well imagine Archbishop Martin has his schedule cleared for tonight. Although hope of a victory is slim, the whole country will be tuning in again this evening to watch the Irish team play Spain. Everyone is "praying for a miracle" as even the most casual fan knows that the Spanish team is significantly more talented than the Irish team. The fans are just hoping that somehow will power will do the trick. A few prayers wouldn't hurt either.